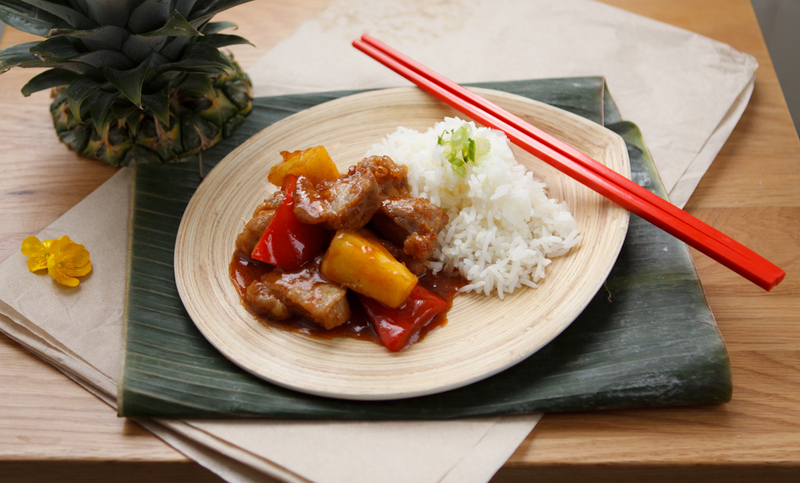 Sweet and sour pork is a dish that is popular in Cantonese cuisine and may be found in Chinese restaurants all over the world. Most Chinese households will know of this dish as it’s a favourite amongst many including myself. The meat should be juicy, not to be over cooked. The sauce a slight lemony, sour flavour coating the deep fried crispy pork. • Wash, drain and cut the pork into bite-size cubes. Marinate with shaoxing wine, chopped garlic and chicken powder for 10 minutes. • Into a pot, add in all the sweet and sour sauce ingredients except from the pineapple. • Mix the thickening sauce ingredients and add into the pot with the sauce. Simmer on a low heat for 5-6 minutes until bubbling hot. Stir to prevent the sauce from sticking to the pot. • Cut the pepper and pineapple into chunks, set aside. • Combine the batter ingredients into a mixing bowl. Add the pork cubes into the batter, coat well. • Heat a wok on a medium setting till smoking hot and add oil for frying. With a wooden chopstick or tongs, place individual cubes into the hot oil in batches and deep fry each side for 1 to 1 ½ minutes. Transfer the pork onto a plate lined with paper towels to soak up any excess oil. • Transfer the hot oil into a bowl, leaving just 1 tablespoon of oil in the wok. Throw in the red peppers and pineapples and stir-fry for 1-2 minute. • Add in the already boiled sauce and cook for 20 seconds before adding in the crispy pork. Mix the ingredients well and serve.